The Career Center is hosting “Lending a Hand for a Living” March 28. Directors from nonprofit organizations including the YMCA, Girl Scouts, Salvation Army, Preferred Family, Chamber of Commerce, Arts Association and the United Way will be sitting on a panel from 5-6 p.m. in the Student Union Building Conference Room. Discussion topics will include experiences as employees in the nonprofit sector and suggestions and answers for students who are interested in similar career paths. The Career Center has created informational posters and handouts on other nonprofits. The posters will be on display following the panel from 6-9 p.m. in the Student Union Building Activities Room. Stop by this informal exposé to enjoy some refreshments and learn more about nonprofit organizations. (Pictured from left to right) Whitney McFerron, Sara DeGonia, Erin Clark and Evangeline McMullen pose with the Apple Awards. McFerron is the managing editor of the Index and DeGonia is the editor in chief. Clark is the editor in chief of Detours and McMullen is the managing editor. Both the Index and Detours won the Best in Show Apple Award in their respective categories at the College Media Adviser’s National College Media Convention held March 15-17 in New York City. This is the second consecutive year that Detours, Truman’s regional travel magazine, has won the Apple Award in the general interest category. The competition pitted the publication against more than 30 student publications from across the United States, including colleges of every size. The publication entered its latest issue, Winter 2007, in the competition. Copies of this issue can be picked up outside the Center for Student Involvement. Detours is published twice a year, once in the summer and once in the winter. Erin Clark, a senior communication and English double major from Lincoln, Ill., is the editor in chief and Evangeline McMullen, a senior English major from Independence, Mo., is the managing editor. Karon Speckman, associate professor of communication, advises the publication. The Index, Truman’s weekly student-produced newspaper, won the Apple Award for best four-year nondaily broadsheet newspaper. This is the fourth time in five years the Index has received this honor, beating out newspapers from across the country. Judges looked at various criteria when determining the winner including news judgment, journalistic quality, quality of writing, variety and diversity of news, photography and layout and design. Sara DeGonia, a senior communication and English double major from Liberty, Mo., is the editor in chief of the Index and Whitney McFerron, a senior communication and English double major from Advance, Mo., is the managing editor. Steve Stepanek, assistant professor of communication, is the newspaper’s adviser. 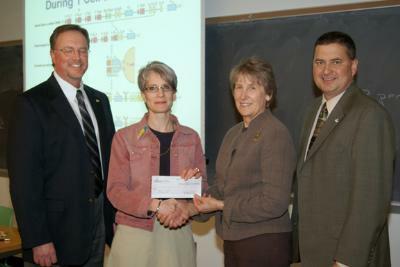 Diane Janick-Buckner (second from left), receives the 2007 Walker and Doris Allen Fellowship from Vice President for Academic Affairs Garry Gordon (left), Truman State University President Barbara Dixon (third from left) and Vice President for University Advancement Mark Gambaiana (right). 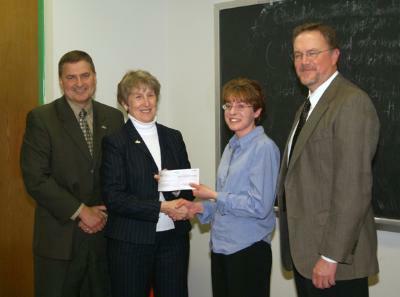 Teresa Heckert (third from left), receives the 2007 Walker and Doris Allen Fellowship from Vice President for University Advancement Mark Gambaiana (left), Truman State University President Barbara Dixon (second from left) and Vice President for Academic Affairs Garry Gordon (right). 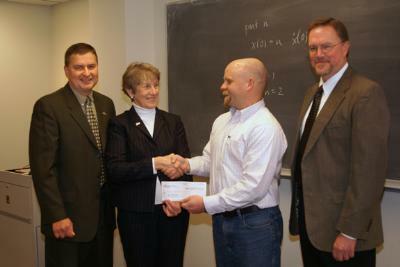 Jason Miller (third from left), receives the 2007 Walker and Doris Allen Fellowship from Vice President for University Advancement Mark Gambaiana (left), Truman State University President Barbara Dixon (second from left) and Vice President for Academic Affairs Garry Gordon (right). President Barbara Dixon, Vice President for Academic Affairs Garry Gordon and Vice President for University Advancement Mark Gambaiana presented three faculty members with the $10,000 Walker and Doris Allen Fellowship March 19 and 20. Diane Janick-Buckner, professor of biology; Teresa Heckert, associate professor of psychology; and Jason Miller, associate professor of mathematics; each received a 2007 Fellowship. The Fellowships were presented in front of each faculty member’s class, surprising the faculty member and their students. Alumni Walker and Doris Allen established the Fellowship six years ago with one of the largest outright gifts ever made to the Truman State University Foundation. Two teams of Truman students recently received honors in the Mathematical Contest in Modeling, an international problem-solving competition held by the Consortium for Mathematics and Its Applications. The team of Bach Ha, a senior computer science and mathematics double major from Hanoi, Vietnam; Dan Matheny, a senior mathematics major from Columbia, Mo. ; and Spencer Tipping, a sophomore computer science major from New Boston, Mo. ; won the contest. They were designated “Outstanding Winners,” beating 943 teams, tying with five others, including teams from Harvard and MIT, and losing to no one. Their solution was also selected as the Mathematical Association of America Prize winner, meaning it will be published in an upcoming issue of the journal, Undergraduate Mathematics and its Applications. The second team included Adam Gouge, a senior mathematics and physics double major from Seneca, Mo. ; Kristofer (Kip) Raske, a junior mathematics major from St. Louis; and Matt Sealy, a senior mathematics and physics double major from Joliet, Ill. They captured an “Honorable Mention,” beating 558 teams and placing in the top 27 percent. Both teams have been asked to present their results at the Fourth Midwest Undergraduate Mathematics Symposium March 30-31 at Simpson College in Iowa. The teams were advised by Steven Smith, professor of mathematics. For the contest, teams were to solve one of two designated problems within 96 hours. Team advisers then mailed off the solutions. Truman began competing in this contest in 1989 and these are the 13th and 14th teams from the University to receive awards. This marks only the third year that both Truman teams have received an award and the first year that a team from Truman has won the contest. Truman is now accepting applications for the 2007 Scholarship of Assessment Grants. These grants are directed toward two basic goals: 1) to improve the quality of student learning and development at Truman, and 2) to enhance the culture of assessment through faculty and staff participation in assessment research and scholarship. All competitive grant proposals will focus on the use of assessment data to answer questions of importance to the University community. Priority will be given to those grant proposals that make connections between assessment of student learning outcomes at the classroom, program, and University levels, including the selection or development of appropriate discipline-level senior tests. Please see http://assessment.truman.edu/grants/index.htm for complete information, the Grant guidelines, and application form. The application deadline is April 10. A cooperative of Truman organizations will host an all-campus dinner from 5:30-8:30 p.m. April 1 in the Ryle Hall Main Lounge. The dinner is designed to increase awareness and raise money for the AMIGOS organization. A buffet will be provided by local Mexican restaurants and anyone willing to bring a dish. Those wanting to attend can pay an entry fee or donate hygienic items or toys to AMIGOS. AMIGOS de las Américas is a nonprofit organization that works to build partnerships through it efforts of strengthening a multicultural understanding of the Americas. The organization provides volunteer opportunities for young people and supports hundreds of communities in the Americas. Sponsoring organizations include Hablantes Unidos, Residence Life, Spanish Club, Spanish faculty and Casa Hispánica. Contact Amy Bockelman, Centennial Hall student adviser, at aeb973@truman.edu for more information. Accountemps is partnering with the American Institute of Certified Public Accountants to provide $2,500 scholarships to five outstanding students pursuing a degree in accounting, finance or information systems. Applicants must be an AICPA student affiliate member, declared accounting, finance or information systems major with an overall grade point average of at least a 3.0 having completed at least 30 semester hours including six semester hours in accounting. Applicants must be full-time undergraduates or graduate students. Applications are due by April 1. Visit http://www.accountemps.com or http://www.aicpa.org for more information. The Journalism Foundation of Metropolitan St. Louis will be awarding journalism scholarships for the 2007-2008 school year. Students of journalism or related fields who are residents of the St. Louis metropolitan area are eligible to receive the awards. Recipients will be chosen on the basis of aptitude and interest in pursuing a career in journalism or communication. Academic acheivement and financial need will also be taken into account. Applications are available in the Truman State University Financial Aid Office and are due to the Journalism Foundation by April 2. Alpha Delta Kappa, the Sigma chapter of Burlington, Iowa, is offering one $750 scholarship to a Des Moines county undergraduate who is majoring in education. Appplicants must have graduated from a Des Moines county, Iowa high school, show qualities of leadership, demonstrate success in academics and be involved in extracurricular and/or community activities. Financial need will be considered but is not a primary qualification. Visit the Financial Aid office for an application. They are due April 10. The Scholarship Foundation of St. Louis is a nonprofit organization that provides access to higher education to St. Louis area students through interest free loans. The program assists students with financial need. Applicants must have a minimum cumulative grade point average of 2.0, demonstrate good character and must be a permanent resident of St. Louis City, St. Louis county, the Missouri counties of Franklin, Jefferson, Lincoln, St. Charles or Warren or the Illinois counties of Clinton, Jersey, Madison, Monroe or St. Clair for at least two years prior to application. Applications for interest free loans are due April 15. Call 314.725.7990 or e-mail info@sfstl.org for more information. Application packets are available in the Financial Aid office. The Voluntary Service Organization at Columbia Regional Hospital awards scholarships to several students each year. To qualify, applicants must have been accepted into an accredited clinical or professional health care program leading to a state-licensed examination. Applicants are not required to be currently employed by the Columbia Regional Hospital. Stop by the Financial Aid office in McClain Hall 103 for further information about this scholarship. Applications are due at noon April 16. People will be able to learn about Kirksville’s proposed smoking ordinance and hear opinions from candidates in the upcoming elections. Contact Lina Khan at ljk402@truman.edu or at 314.603.5505 for more information. A day of Universitywide celebration of undergraduate and graduate research, scholarship and creative achievement. For a complete schedule of presentations and discussions, see http://src.truman.edu. View part of the program online at http://trumantoday.truman.edu/SRCProgram2007.pdf. Keith Devlin, executive director and senior researcher at the Center for the Study of Language and Information, and will deliver the address. He is also “the Math Guy” on National Public Radio. Learn about passover traditions from around the world. Daniel Mandell, associate professor of history and the adviser of Hillel, and Barbara Smith-Mandell, copy editor/acquisitions editor of the Truman State University Press, will speak on the topic. Attendance at this event partially counts for the half-credit IDSM 300 Folklore Colloquium. Contact Betsy Delmonico at bdelmoni@truman.edu or at 785.4492 for more information. Think Student Senate needs help? Election packets are now available in the Student Senate office on the third floor of the Student Union Building. Those interested need to complete the information and return it by 5 p.m. March 28 in the CSI. Contact Becky Hadley at behad@truman.edu for more information. True Men will be performing old hits and crowd favorites with some alumni members. Alumni who will be in attendance include Nathan Artz, Kurt Bethel, Jon Brader, Nick Cloud, Tony Esterly, Kyle Fieleke, Matt Fieleke, Nathan Gibson, Bob Hembry, Greg Hudson, Chad Lograsso, Casey Morris, B. J. Mumford, Caleb Paulz, Hank Rischar, Travis Russell, Dustin Sollars, Cory Webel, Josh Webster and John Whitley. The show is free and everyone is welcome to attend. Contact Andrew Hardee at andrewhardee@hotmail.com for more information. Volunteers can either work as buddies or in the Olympic Village. Pre-registration is strongly encouraged. Nomination forms are available at http://rcp.truman.edu/lee/LeeNomination.htm. Contact Marty Eisenberg at martye@truman.edu for more information. Start thinking about possible topics, presentations and creating art for the Environmental Studies Conference. Papers and presentations from all disciplines and backgrounds will be accepted. E-mail a concise abstract to cassiephillips@care2.com to submit a proposal. Proposals will be accepted through April 1. Conference submissions are open to students, faculty, staff and Kirksville community members. The Graduate English Organization will host its fourth annual conference April 4 and 5. Presentations and panels will run all day both days in Violette Hall 1000. For a complete schedule, visit http://gradeng.truman.edu. All the events are free and open to the public. Contact Maggie Mayhan at mmayhan@truman.edu or 785.5769 for more information. Scott Ellis, dean of science and professor of biology, will be inducted into the Omicron Delta Kappa Dr. Jack Magruder Faculty Hall of Fame at the Leadership Recognition Program 7 p.m. April 11 in the Student Union Building Lounge. Warren Gooch, professor of music, will serve as Composer-in-Residence with the Hastings Symphony Orchestra April 19-22. Gooch will participate in orchestra rehearsals and will speak to classes at Hastings College (Neb.). Under the direction of Byron Jensen, the Hastings Symphony will perform two orchestral works by Gooch on April 22. They are “Menuet Macabre” and “…We are Experiencing Minor Turbulence…” The Hastings Symphony Orchestra consists of 80 musicians from central Nebraska, Omaha and Lincoln. The SERVE Center is hiring for scholarship and work study positions for fall 2007. Applications are available in the Center for Student Involvement office. Completed applications are due to the CSI by 5 p.m. March 28. Women of Distinction nomination forms are now available at the Women’s Resource Center in the Ryle Hall foyer or online at http://wrc.truman.edu. They are due April 6. Contact Sarah Downey at sed730@truman.edu for more information. Study abroad in the Caribbean. Informational meetings for “Sweet Power: Sugar, Empires and Slaves in the Caribbean,” a six-credit-hour study abroad course scheduled for winter break 2007-2008. The meetings will take place at 6 p.m. March 27 in the Student Union Building Conference Room and at 5 p.m. March 28 in the Student Union Building Alumni Room. The two sessions will be identical, discussing photos, itinerary and ways to finance the program. Contact Steven Reschly at sdr@truman.edu or 785.4648 for more information. The Society for Creative Anachronism presents a series of quests and diversions for your entertainment at 6:30 p.m. March 27 in the Baldwin Hall Taj (first floor near the vending machines). They will be re-creating the Middle Ages. Contact Eric Scott at eos127@truman.edu for more information. The Weekly Lunch Series will continue from 12:30-1:30 p.m. March 28 in the Student Union Building Alumni Room. See what it’s like to live a month in poverty. Students for Social Change invite students to look more deeply into the issue of poverty by simulating a month filed with different events and steps that effect poverty. The simulation will take place from 7:30-9:30 p.m. March 28 in the Student Union Building Conference Room. Contact Natasha Vander Weide at ngv679@truman.edu for more information. The American Medical Student Association will be hosting a Veto the ‘Squito Pajama Party from 7 p.m.-7 a.m. in the Magruder Hall Planetarium March 30. Veto the ‘Squito is a youth campaign aimed at stopping the spread of malaria. A donation of $10 to join the party will pay for one life-saving mosquito net, which will shield a child from malaria-carrying mosquitoes. A 20-minute United Nations documentary will be screened. There will also be party games, prizes and food. Contact Lindsay Allan at lma948@truman.edu or at 785.7112 for more information. Sigma Alpha Iota (SAI) is hosting its Fourth Annual Midwest StringFest March 30-31. March 30 events include performances by visiting ensembles from area high schools. SAI will perform from 7-8 p.m. March 30 in the Ophelia Parrish Performance Hall. There will be workshops all day March 31, concluding with a performance at 4 p.m. in the Ophelia Parrish Performance Hall. Contact Liz Hackney at esh042@truman.edu for more information. Cheerleading tryouts are here. There is a mandatory tryout clinic to learn routines from 8 a.m.-5 p.m. March 31 in the Pershing Small Gym. Tryouts begin at 9 a.m. April 1 in the Pershing Small Gym. Download tryout information and the consent form at http://cheerleading.truman.edu. There will be three forums about the Student Fee to Support Truman’s Athletics Program proposal. The forums will take place at 5 p.m. April 1 in Pershing Building 325, at 6 p.m. April 2 in the Student Union Building Conference Room, and at 7:30 p.m. April 5 in Violette Hall 1010. The proposal calls for a ballot item to be placed before Truman students in the April 2007 student elections. The ballot proposal would ask to implement a fee of $50 per student per semester to support improvements that will enhance Truman’s athletics program and benefit the greater student body through the improvement of facilities used by not only athletes, but by the larger student body through their use in health and exercise science classes and Truman’s intramural program. The purpose of this fee will be to increase funds for athletics and related facilities, and not to replace existing funds to these programs already allocated by the University. Campus Crusade for Christ is holding its Third Annual Free Spaghetti Dinner from 6-8 p.m. April 1 in the Centennial Hall Main Lounge. Everyone is welcome.Contact Devin Tressler at DevinT@truman.edu or 785.7319 for more information. Sodexho’s annual food drive will take place April 2-6. All donations will be delivered to Kirksville’s local food bank in time for Easter. Donate nonperishable items, meals, dining dollars or bonus bucks. Carts will be available at all dining halls, C-stores and Mainstreet Market for food items and donation sheets will be available at the cash registers. Cardinal Key is having a service auction from 10:30 a.m.-2:30 p.m. April 4 and 5 in Violette Hall. Contact Lauren Hamilton at llh139@truman.edu for more information. Cardinal Key, the Adair County Family YMCA and Kirksville Parks and Recreation present the 29th Annual Children’s Free Easter Egg Hunt at 10 a.m. April 7 on the Quadrangle. Call 627.1485 for more information. The Spring Workshop Series continues with a presentation on “Careers in STEM: Ph.D. and M.D.Ph.D. Careers” from 5:30-7 p.m. April 12 in Magruder Hall 1090. Join Alan Garvey and Pam Ryan in discussing the opportunities available after you have obtained a Ph.D. in math and computer science. Other panelists will also be on hand. Healthy Habits! There will be a seminar on planning and maintaining a healthy lifestyle from 5-5:30 p.m. April 16 in the Student Recreation Center Conference Room. Contact Andrea Rhodus at adr602@truman.edu for more information. The 33rd annual Service Recognition Banquet will take place at 6:30 p.m. April 17 in the Student Union Building Lounge. Approximately 149 current and retired members of the University will be honored for their commitment to the University. Due to limited seating, tickets will not go on sale to the public until April 6, at which time they will be available in the Human Resources office in McClain Hall 106 for $10 each.